It appears the free ride is coming to an end for Facebook Business Pages and, to put it mildly, marketers and business owners are not happy about it. Facebook says recent algorithm changes are intended to create a better overall user experience, but most aren't buying that argument. Once upon a time (way back in 2012), marketers happily competed for 'likes', knowing that once someone 'liked' their Facebook business page, every subsequent post to that business page would appear in that fan's newsfeed. From that point on, fans could like and share individual posts, further improving the reach of that business page. You could also count on the fact that if your business page had 250 fans, everything you posted would be delivered to 250 newsfeeds, with the added benefit that these were people who had already chosen to engage with your business at least once. Make no mistake about it, marketers and social media managers invested a lot time and money - as much as $1 per like - building Facebook followings for their companies, knowing the payoff could be huge in terms of reaching new customers. Over the past several months, however, some people started noticing that the number of likes and shares on their posts were dropping significantly. It didn't take long to track that decline back to the fact that their posts suddenly weren't reaching all of their fans. In the past, a page with 1,500 fans would see its posts reach nearly 100% of those newsfeeds. 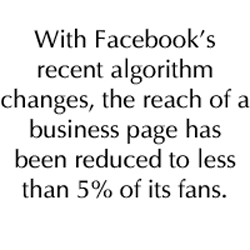 However, with Facebook's recent algorithm changes, that reach has been reduced to less than 5% of those fans. It took a while for marketers to really register the decline, but now that they have, reactions have been pouring in. "And just like that, Facebook goes the way of magazines and television commercials - priced only for the big boys and shutting the door in the face of small business," commented Julie Sturgeon, owner of an online newspaper, in reaction to the Ad Age article Facebook Admits Organic Reach is Falling Short, Urges Marketers to Buy Ads. "But the real problem, I think, is that businesses are allowing Facebook to perpetuate this system and encourage it. Facebook is creating a Pay to Play system and everyone who participates is feeding the system," said social media manager Mike Alton in a recent article published by The Social Media Hat, Why You Should Opt Out Of Facebook Advertising. "How long before businesses have to pay for every post to be seen by even one person?" "The future of businesses on Facebook looks grim for those who don't want to pay to play," said Jennifer Slegg, a writer with Search Engine Watch, in her article entitled Facebook Admits: Expect Organic Reach for Pages to Continue Declining. "As more businesses are forced to turn to paid promotion, the cost of promoting posts on Facebook is set to skyrocket. The way businesses do business on Facebook is changing and it's going to be expensive." "Bold move, Facebook. All this will do is continue to push people (users and businesses) to use Twitter to interact with businesses and brands that they 'like'. I understand wanting to get paid (if you can) for something that is free currently, but this is pushing the money grab a little too much. I don't 'like' this at all." A comment posted by JoshFialky in response to a Search Engine Watch article, Facebook Admits: Expect Organic Reach for Pages to Continue Declining. There's no question the reach of business pages has been reduced and will probably drop even further, according to a recent statement from Facebook. "We expect organic distribution of an individual page's posts to gradually decline over time as we continually work to make sure people have a meaningful experience on the site," Facebook said in a document sent to the partners in November 2013 and released to Ad Age. The document goes on to suggest that marketers should consider paid distribution if they want to be in the newsfeeds. 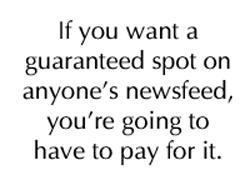 And that's the bottom line: If you want a guaranteed spot on anyone's newsfeed, you're going to have to pay for it. If you choose not to spend any money promoting your Facebook posts, they will only be seen by a dwindling number of your fans and you will, naturally, see fewer likes and shares per post, as well. But back up a second. There was something in that statement about creating a 'meaningful experience' for users. Could there be another side to this story that shows Facebook as more than an evil money-grabber? Forcing business pages to pay for a guaranteed spot on the newsfeeds benefits Facebook, of course, but it is also good for users. Think about it. 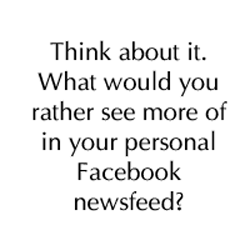 What would you rather see more of in your personal Facebook newsfeed? "We're getting to a place where, because more people are sharing more things, the best way to get your stuff seen is to pay for it," a Facebook spokesperson told Ad Age. The reality is, Facebook is becoming a crowded super highway of information. Users can only take in so much. So Facebook has been forced to limit the business posts people are exposed to in order to keep their newsfeeds interesting and filled with content they want to engage with - namely interesting articles, videos, photos and updates from their friends. It's not that users don't ever want to see posts from businesses they have liked. But they don't want that to be all they see on their newsfeeds. "If brands were to continue reaching the same amount of people as a percentage of their fan base, (Facebook would) be giving preferential treatment to them over a user," said Alex Jacobs, VP-Social Marketing with Digitas. Business pages are the only losers in this scenario and they only lose in the sense that their 'free ride' is over. Savvy marketers and business owners recognize this reality and are already making the mental transition. "I can also understand why Facebook is cutting back on businesses showing up in the newsfeed organically. The last thing we want is a bunch of short-term minded businesses spamming the newsfeed all day trying to cram their promotions down Facebook users' throats - this would truly make Facebook obsolete. We want Facebook to keep the user experience high for the end user, not for us business owners. It may be a little more difficult now but it can be much more profitable for those willing to put in the work and the right systems." From a comment posted by Keith Kranc in response to an article from The Social Media Hat, Why You Should Opt Out of Facebook Advertising. Marketers do have other options to promote their businesses online, including refusing to pay or simply leaving Facebook altogether to seek greener pastures with Google+, Twitter or Pinterest. However, Facebook is still the social network with the most users, by a fairly healthy margin. Google+ boasts about 500 million users, while Facebook has well over a billion. Smart marketers won't just jump ship, leaving that many users behind. And remember, just because G+ and the rest are allowing free promotion of business posts now, doesn't mean they won't soon switch to their own 'pay to play' model. Every social network is a business first. However they may market themselves, their end game is to make money, the same as it is for any other business. If they can find a way to increase revenue while still keeping their users happy and active on their sites, why wouldn't they do it? Facebook happened to be the first to try and strike that balance.